Cover artwork for Science News article on the Discovery of the Higgs Boson, by N.R.Fuller of Sayo-Art LLC. The Higgs boson has been the Holy Grail of physics since its proposal in the 1970s, so the announcement of its discovery on July 4th from scientists at CERN marked a watershed moment within the history of physics. I’m excited to be a small part of the history by getting to create the artwork for the Science News cover and article on the subject. When I first began my illustration career I interned at the Stanford Linear Accelerator Center and got a crash course in particle physics. I don’t get to attempt the impossible and draw sub-atomic particles as much as I used to, so this was an exciting return. And luckily for me, the editors at Science News had clear ideas on what they wanted illustrated for the topic — as much as I love tackling conceptually difficult subjects, it’s great to have some help when it comes to particle physics. 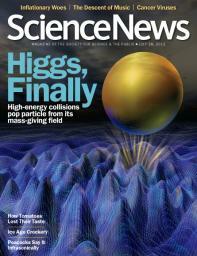 The cover artwork for the July 28th issue of Science News shows the vigorous shaking of the field needed for the Higgs particle to ‘pop’ out. The Higgs particle has been sought for 20 years, since 1973 when it was first proposed. The Large Hadron Collider was completed in 2008, at a cost of 9 billion dollars, largely with the hope of discovering the Higgs (or not). Billions of dollars to discover one particle? The Higgs particle isn’t called the God particle for nothing. It is the lynchpin of modern theories, that couldn’t be verified until now. The discovery of the Higgs Boson particle could be an important first step towards understanding the 96% of our universe that is made up of dark matter and dark energy, the 96% that still remains mysterious and unknown. Still, whatever comes in the future from this discovery, July 4th 2012 will certainly be remembered as a landmark day within physics and the scientific community as a whole.